Celebrate God's goodness. Make much of God. Point out what he has done well, beautifully, creatively, redemptively, and lovingly. Acknowledge failures - when I did what I should not or did not do what I should. Decide to take real steps to fight such habitual sin. Pray for others. The sick, the poor, the victimized, the Church, your enemies, your neighbors, marriages, children, teachers, governments, etc. Lastly remember yourself. Pour out your heart to God and trust that he cares. Remember not to pray for yourself, things you cannot also pray in good conscious for others. "OUR daily bread." "forgive OUR debts." "Lead US not into temptation." I cannot recommend this book highly enough. If you only read 5 books to augment your walk with Jesus in the next 10 years, make sure this is one of them. His chapter on Prayer (Chpt 3) is a great starting point for learning to pray. Philip Yancey is one of the best pastors/writers/thinkers of our time. Following in Max Lucado or or John Stott's shoes, Yancey's book on prayer is a thorough going treatment of the Biblical texts, Christian theology, and finally practical advice. It is appropriate for people wrestling with philosophical questions about prayer, before they can even start praying. This sermon series includes a weekly Bible Reading Plan. Each week we read in preparation for the sermon coming next week. 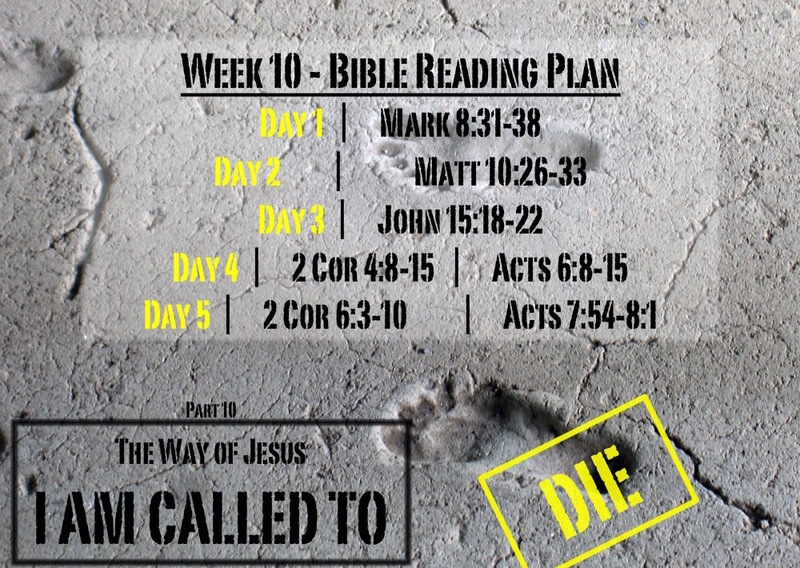 Next week we will finish our sermon series by discussing The Way of Jesus - I am called to DIE, so this week we will be reading about "taking up our cross" using this WEEK 10 READING PLAN. Tips and suggested questions available on the PDF. Posted in Sermons and tagged Does it make any difference, I am Called to, Our Father, P.R.A.Y., Pray, Prayer, Talk to God, The Lord's Prayer, The Way of Jesus.